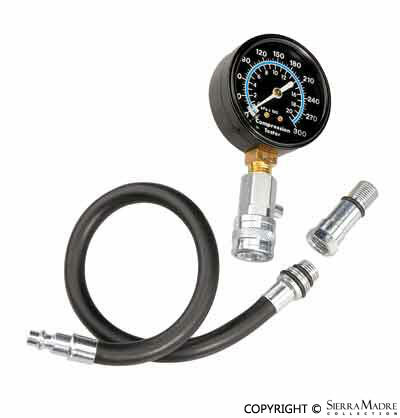 This compression tester kit measures cylinder compression to accurately diagnose any engine problems. Allows you to measure pressure within the combustion chamber as the piston comes up on the compression stroke. A push-button side release valve is included for repeated testing without disconnecting. This unit has a 1 year warranty. - Measures cylinder compression to accurately diagnose engine condition. - Tester has 14" high pressure flexible oil & grease resistant hose. - Compression tester has external pressure relief valve. - 14mm & 18mm ends fit most spark plug openings.